This famous “Sago porridge” needs no introduction. It not only strengthens our bones,ligaments and muscles but also tastes good. In India it is mostly prepared during fasts such as the upcoming “navratri” or any other fast which omits grains. 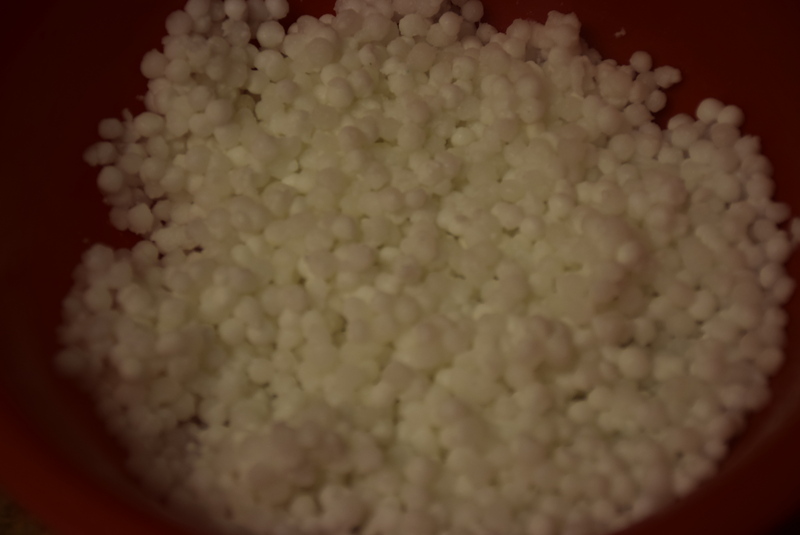 However, there is a misconception that tapioca and Sago are the same.Though they are like identical twins but they are not 😛 . For reading more please refer to : Tapioca vs Sago. 1. Soak the sabutdana after washing it once in equal water overnight or at least for 3-4 hrs. 2. After 4 hrs, you will see it has absorbed nearly all the water and has doubled in size. Drain the excess water if left. 3. Heat a wok(kadhai) or pan with some oil in it. Some people love to make it in Ghee(clarified butter) because of fast, but I found that it gets soggy initially and then dries up quickly if made in ghee. 4. Now add the jeera and let it sizzle. 5. Roast the peanuts in microwave for 30 secs two times or dry roast them in another pan. 6. Add the boiled potatoes, peanuts and sago together in the pan. 7. Quickly add the rock salt, green chilly,coriander powder and stir them all together. Lower the heat or the sago might stick to the bottom. 8. In the end squeeze in some lemon juice and mix well. Turn off the heat. 9. 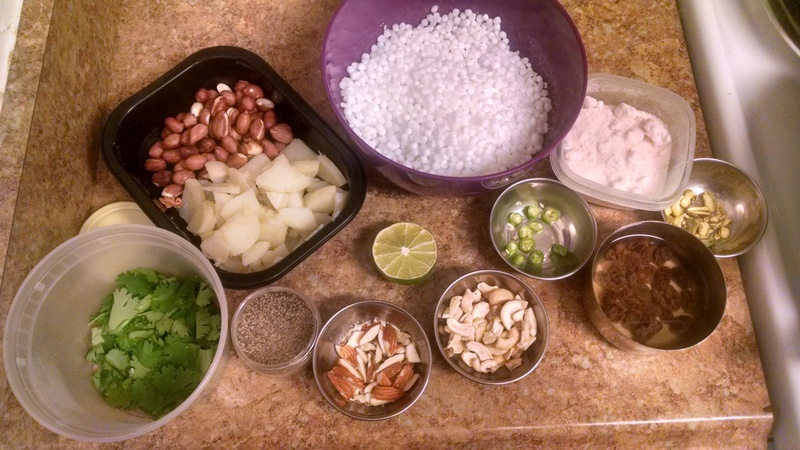 Garnish it with chopped coriander leaves and nuts of your choice. Serve hot. The above recipe is strictly with respect to fasts but in a daily routine you may add chopped tomatoes, curry leaves( kadi patta/meetha neem) , red chilli powder, amchur powder etc to bring in the taste you prefer. In some places, even these are prohibited during fasts. Please feel free to ask or comment below!! We would love to hear from you!! 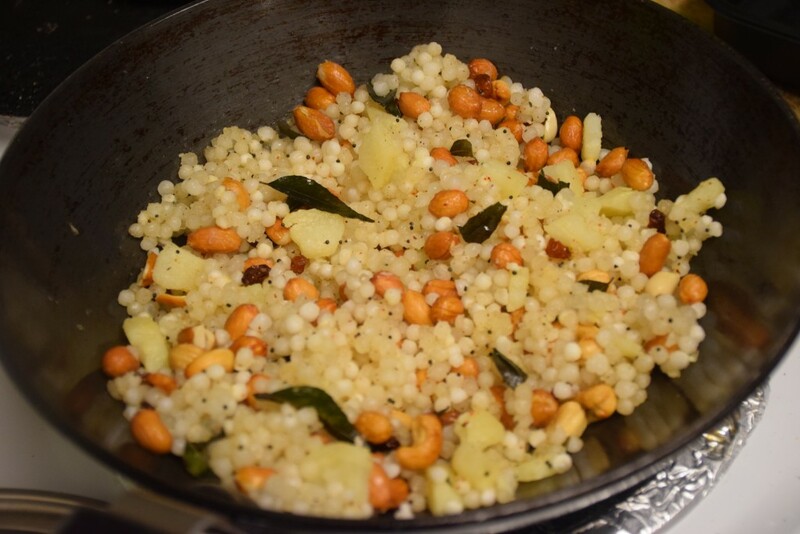 This entry was posted in Food, Recipes, Vrat Recipes and tagged 5 mins recipe, appetizer, difference between sago and tapioca, energizer, energy boosting ingredient, fast, fresh, khichdi, not a grain, palm tree, pulao, rock salt, sabutdana, salty, Savoury, sendha namak, snack, tasty, trunk or pith of (Metroxylon sagu, vrat recipe.